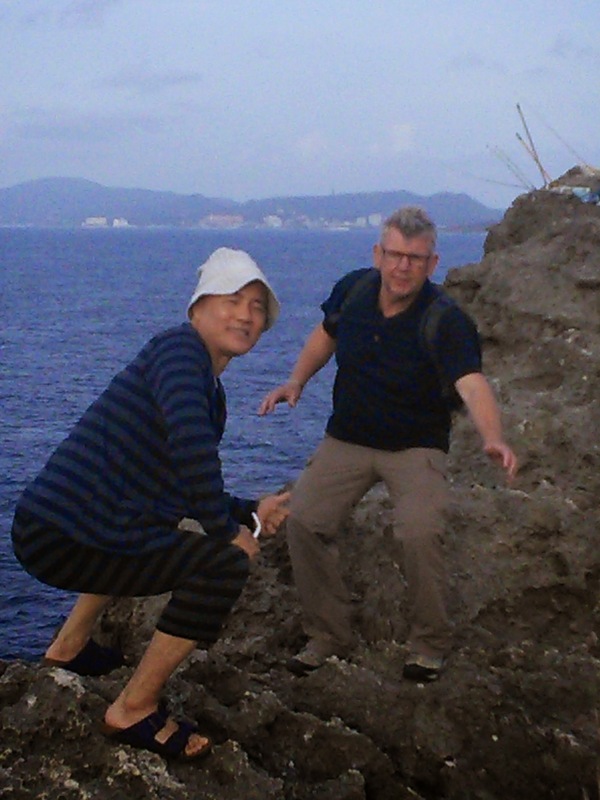 It’s difficult to know where to start to describe our stay in Okinawa. It’s a tiny island, about a quarter the size of Norfolk (or 0.73% the size of California for our American readers) a similar size to Orkney with a population of 1,301,462 (Orkney has about 21,000). Before we came we knew it was a popular destination for Japanese tourists from the mainland (well over five hundred kilometres away) and that there was a strong US military presence. And that was about it. Before the Japanese came the Ryukyu lived here. They had their own language, religion and customs. This is all still very much in evidence though I’m not sure how much ‘living’ Ryukyu culture remains. One day we took a bus north to a town called Nago. It was an overcast, rainy day and the bus was slow and cost a fortune but we found a quaint little museum, mainly aimed at local school children, explaining some of the social history of the Ryukyus, as the Okinawan group of islands was previously known. Because of its location in the middle of the Pacific it has long been an important trading crossroads for China, Japan, Korea, the Philippines and others. The museum also had information about natural history (mainly whales and LOTS of snakes). Our host, Kiichi, took us to a castle which is now an activity centre for Ryukyu customs and we heard their music, smelt their food, and saw the form their gods take. The belief in these traditional superstitions is still alive as many houses have gargoyle like figures on the roof to protect them from evil spirits. 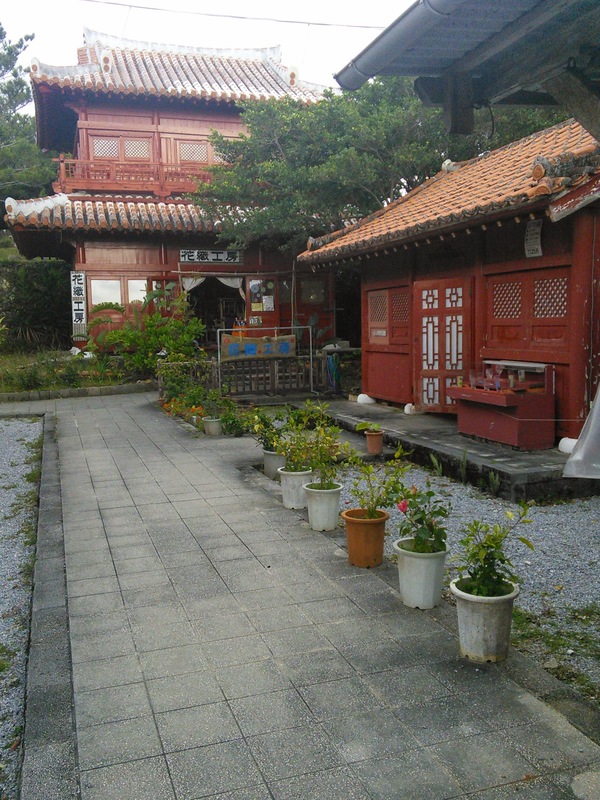 Kiichi also took us to a traditional place of worship that is now a world heritage site. It was in the most beautiful peaceful jungle setting with lush green leaves, birdcall and butterflies all around. 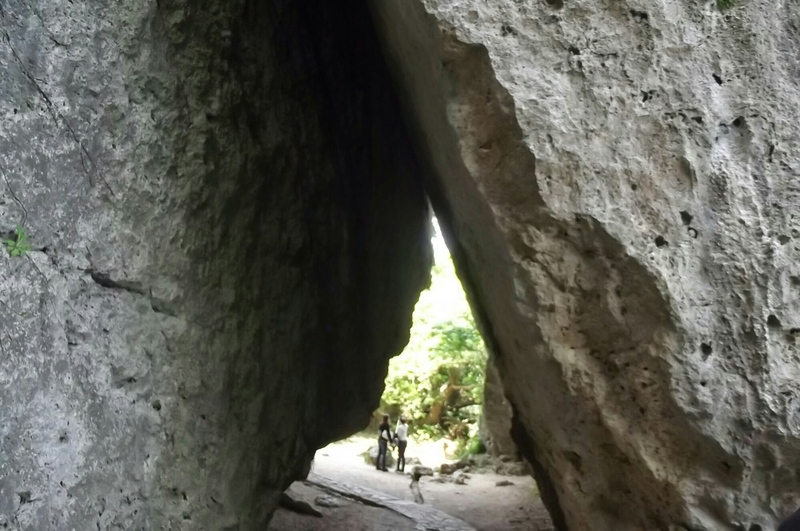 A series of rock formations, including two stalactites, marked where the worship took place and the highest point was a triangular pair of rocks that provided a window to the Pacific Ocean beyond. Quite glorious! On the way down from the sacred place Kiichi spotted a hidden path leading up to the garden of a traditional Japanese house. On closer inspection we found the garden overlooked the ocean and served food. We also noticed the house was made of concrete, but we decided to eat there anyway. Kiichi said typhoons destroyed the more traditional wooden houses so they were now made of concrete but we also heard it was because most of the wooden houses were destroyed during the war. 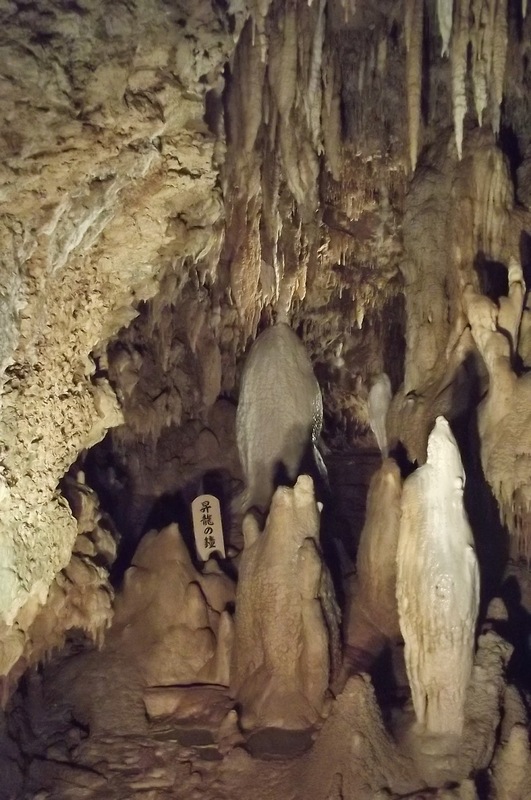 We also went to some magnificent caves with Kiichi and saw a show of traditional dance, drumming and singing. 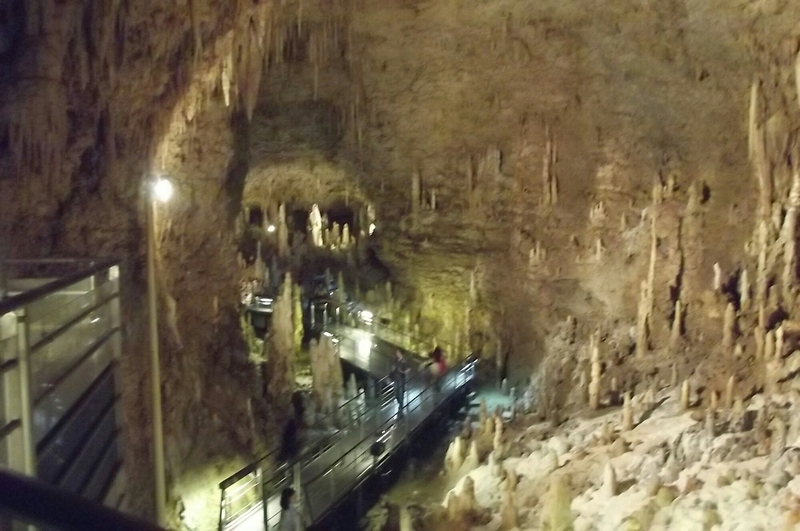 The caves form an extensive network of interconnected caverns, paths and underground rivers. Today they are well lit, signposted and beautiful, like a fairytale underworld cathedral. 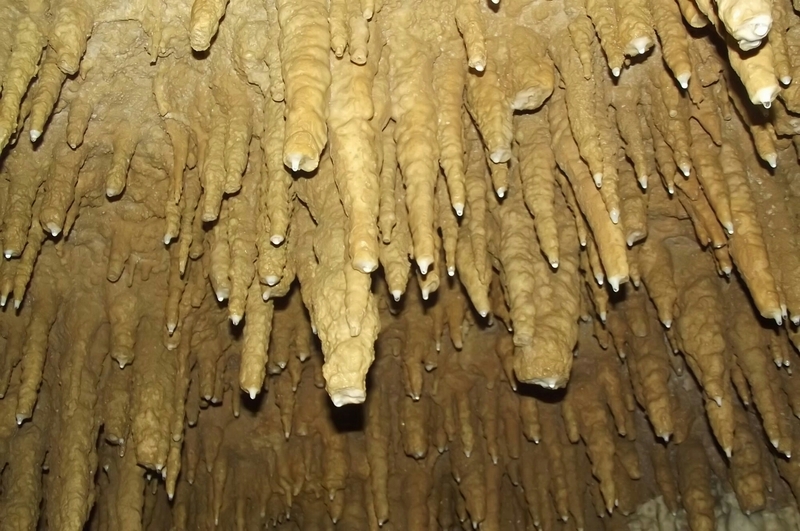 Without the modern facilities they could be a place of refuge or a prison, warm, dark and very humid, hence the creation of thousands of stalactites and stalagmites. It would be very easy to get lost down here. Later, the Japanese dominated the islands and banned the use of the Ryukyu language. 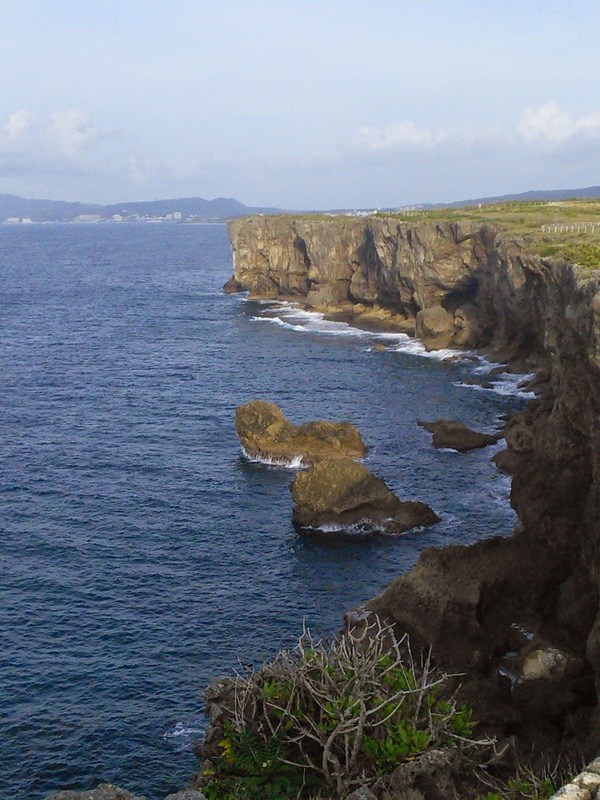 The next major event that we learnt about was the horrendous Battle of Okinawa in 1945. The Allies had a strategy of ‘island hopping’ to work their way to Japan by a series of defeats. They arrived in Okinawa in March 1945. The people were suffering from malnutrition, malaria and other diseases. Desperate Japanese soldiers had already been stationed here for some time and they had coerced the local people, including women and children into semi-military duties such as providing look outs, or transporting food and supplies to the soldiers. They also exhorted people to kill each other or commit suicide in order to avoid capture by the enemy. They issued hand grenades and cyanide for this purpose. The Allies landed on April 1, the first day of a ninety day ‘Typhoon of Steel’ that rained down on this tiny island, destroying everything until it was a quagmire of mud and dead bodies. People took refuge in caves, tombs, pigsties and in death. They ate raw meat, drank their own urine and killed each other in desperate attempts to survive, or out of mercy. 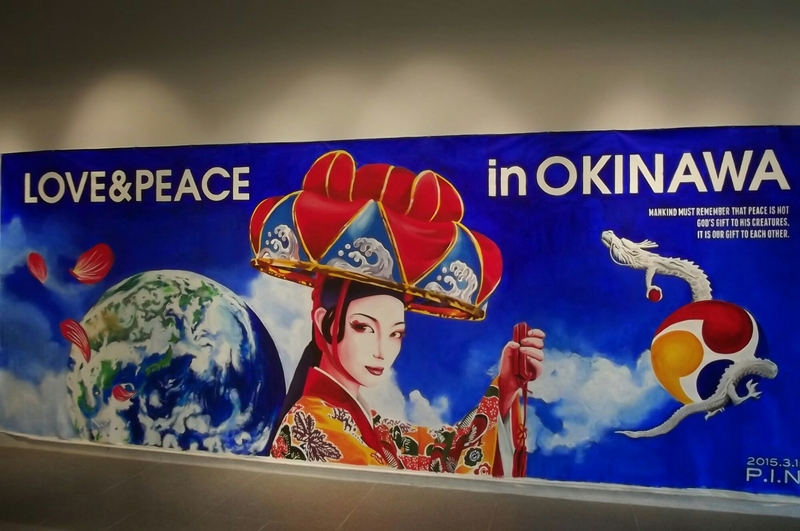 We went to the Heiwa Kinen Park, the Okinawa Prefectural Peace Memorial Park, where we learnt the story of the Battle and its aftermath through sensitive displays and first hand accounts. In the park there are memorials to all those known to have lost their lives at that time. 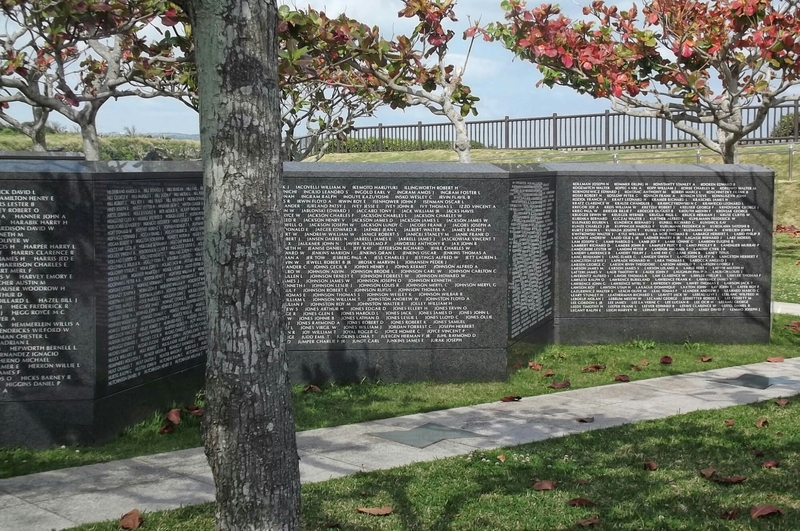 149,329 Okinawans; 77,380 other Japanese; 14,000 Americans, 82 from the UK, 34 Taiwanese and 450 Koreans. 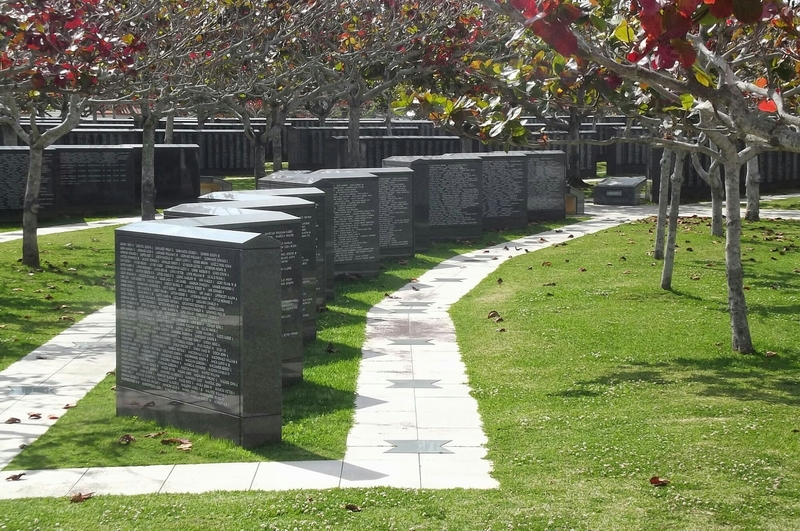 All the names are inscribed on memorial stones. 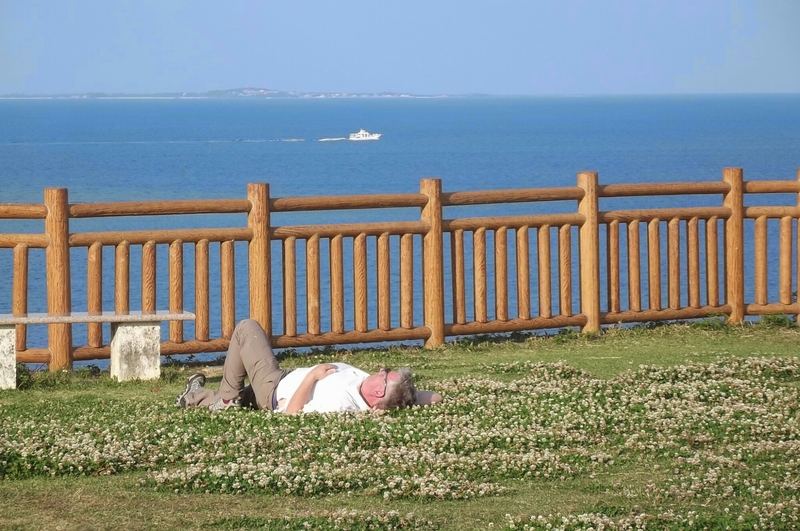 The Peace Park is in a wonderful location overlooking the sea and provides peaceful areas for contemplation as well as play areas for children and sculptures from every prefecture in Japan. After the war Okinawa remained in American hands. The Americans requisitioned large areas of land for military use and later used the island as a base in the Vietnam war, and for the deployment of nuclear weapons. As a consequence the Okinawans began to call for the reversion of Okinawa to Japan and this was achieved in 1972. The American military is still very much in evidence here. Opposite our apartment is a large military base and copious amounts of military vehicles. We’ve heard and seen American aircraft overhead, American marines swearing at each other outside the nightclub over the road and bugle calls (as well as numbers of happy American families). 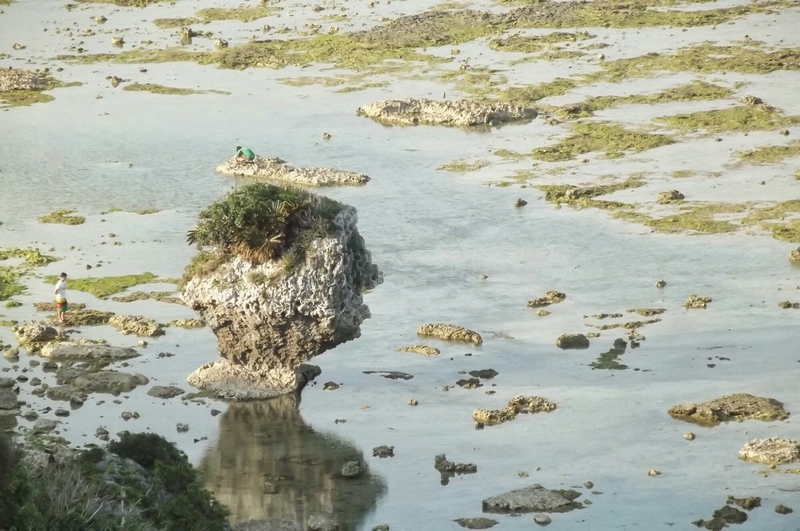 It’s hard to believe that the Okinawans are entirely happy with their presence but nobody has told us otherwise. Kiichi is the landlord of the apartment we’ve been staying in this week. We booked through airbnb. The budget was a bit stretched but we have had an entire apartment with a fully equipped kitchen, washing machine, wonderfully comfortable bed and hot, deep bath. Naturally we paid Kiichi for this. But on top of that he left fruit, beer and essentials in the fridge, came out specially to help us hire a car, which we would not have been able to do as non Japanese speakers, then took us out for coffee and cake and drove us up to a beautiful cape near here. He gave up a whole day to guide us on Monday and tomorrow he’s going to pick us up and take us to the airport. He’s quite a character, with a unique fashion sense who, until recently, owned a nightclub. Now he has ambitions to work in the film industry and is working on a project with a director from Tokyo. He doesn’t speak a huge amount of English but what he lacks in skill he makes up for in enthusiasm. An all-round lovely man! 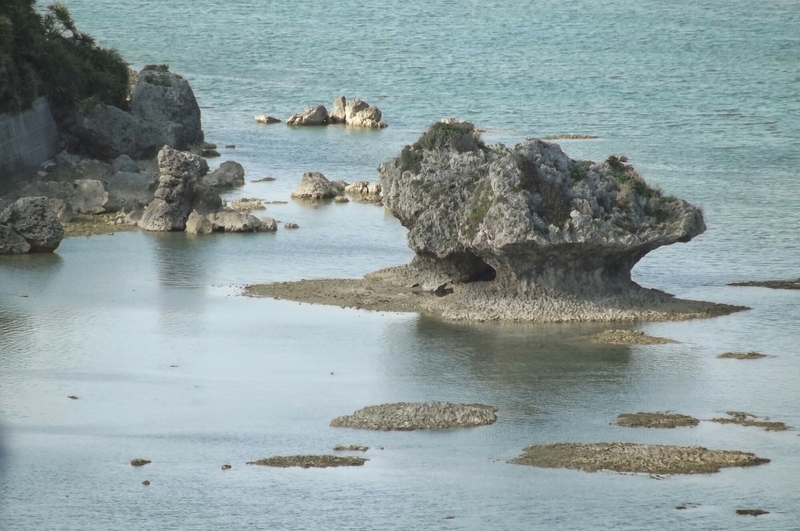 We now know Okinawa to be a beautiful island populated by polite, friendly people who have been through a lot. The sea is turquoise blue, waves lap over the coral reef not too far off the shore and there are areas of wonderful tranquility despite the dense population. 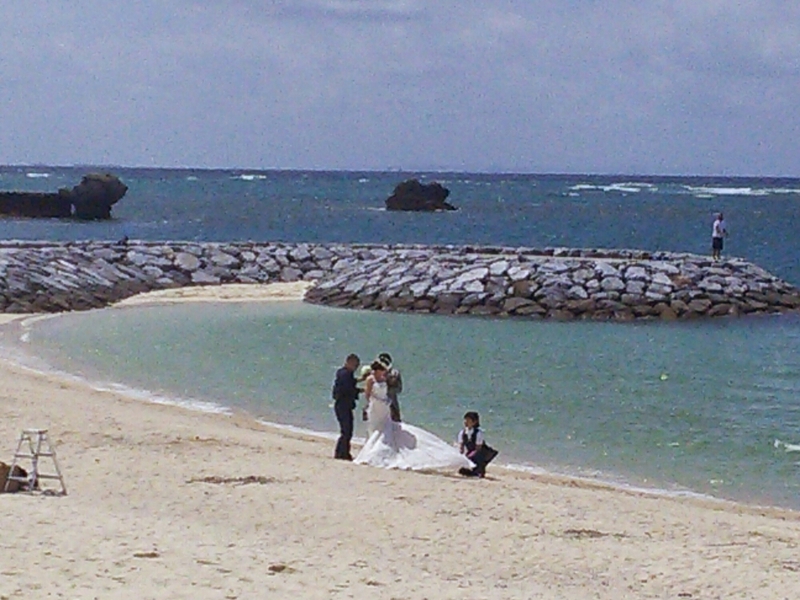 Not surprisingly, many happy couples choose to have their wedding photos on the beach. It was a very happy accident to discover this place. Tomorrow we fly to Osaka, where our next hosts have very kindly offered to pick us up and take us to their home in Sakai. We feel slightly uneasy about this as it’s a couch surfing arrangement, which means we don’t pay anything, so we are very anxious to make sure we contribute in some way. More on this story later! Previous Previous post: Building to the limit.